When getting legally separated, it is important to treat the separation the same as you would a final divorce. You should consider all aspects of your financial picture, as well as your parenting roles. With the help of an experienced Maryland family law attorney, you should be able to reach an amicable and mutually fair and reasonable separation agreement while waiting to finalize your divorce. Here are seven specific things to consider when making a separation agreement. In Maryland, you have two basic options for divorce: you can allege grounds or you can petition for a no-fault divorce. If there are grounds, such as adultery, abuse, and so forth, you can immediately petition for dissolution without any waiting period. The process will still take time, but the law won’t make you wait, assuming you can prove grounds. The second option is to show that you and your spouse have been voluntarily separated for a year. 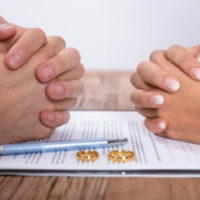 Therefore, if you and your spouse still live together, you will need to establish a separation agreement that will set forth the terms of your arrangement while waiting for the 1-year waiting period to pass. Don’t overlook the need to outline who gets the children and when. This is often the most contentious and difficult part of working out a separation agreement. Will you need to pay your spouse or will he or she need to pay you? How much? While you cannot reduce your support obligations through a private contract, child support should be detailed and explained in some way so that there is a formal agreement. If either spouse owns part of a business, you should make sure that any ownership and profits issues are dealt with in the agreement so that there is no misunderstanding about who should receive funds and profits from the business. It’s not just the home and the kids that you will need to agree upon; you also need to decide who keeps the TVs, who gets the furniture, and who keeps certain heirlooms and mementos, such as family photo albums and the like. Just like children, pets can be a huge source of fighting. Don’t leave this up to a handshake. Put in writing who will have the pet and if there will be any visitation or shared time. Anymore, debt is becoming a bigger issue in divorce than in the past. Many marriages include crushing student loans, mortgages, and huge credit card balances. According to Lending Tree, Maryland residents pay about $1,326 per month for their primary mortgage, making our state the sixth highest average mortgage cost in the nation. Make sure to agree on who will pay the debts and who will be responsible for loan payments. Otherwise, you run the risk of having your credit destroyed by a vindictive ex who shares no financial responsibility for poor management of debt payments. It should come as no surprise that it could be hard to continue paying a big mortgage if the parties are divorced and no longer living together and sharing the financial obligations. It may be necessary to sell a home or downsize prior to finalizing the divorce. Work out who is going to move and who is staying. Also work out if changes need to be made for the benefit of everyone involved. Even if you aren’t sure about divorce, if you are considering it, then it’s usually a good idea to schedule a meeting with a Maryland divorce attorney to discuss all these issues early. Doing so will give you a better picture of what to expect and help you make good choices. Call the Law Offices of Todd K. Mohink, P.A. today to schedule your own private consultation.